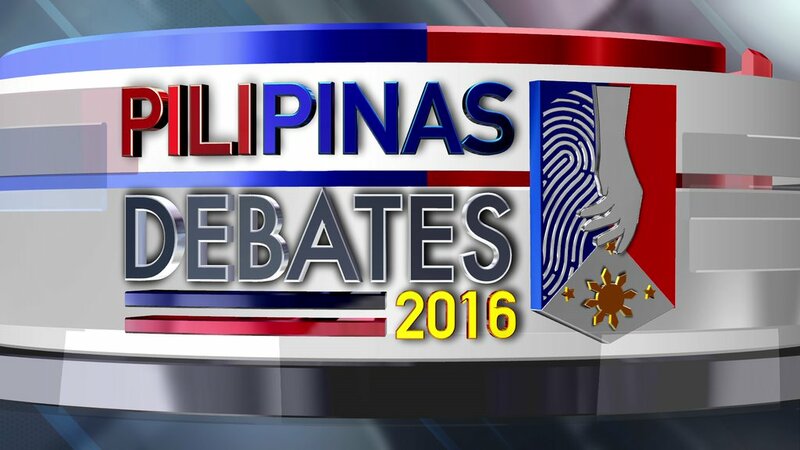 MANILA, Philippines - The third and final leg of presidential debate dubbed as "PiliPinas Debates 2016" happens today, April 24, 2016 at the Student Plaza of Phinma-University of Pangasinan in Dagupan City. ABS-CBN, the broadcast partner mounts full livestream of this townhall debate. ABS-CBN, Manila Bulletin, the Commission on Elections (Comelec) and the Kapisanan ng mga Brodkaster ng Pilipinas (KBP) set the final showdown of PiliPinas 2016 Presidential Town Hall Debate series two weeks before the May 9 elections. The pre-program will air at 5:45 p.m. on ABS-CBN. Debate proper begins at 6 p.m. There will also be a “HALALAN 2016 Debate Special” on ANC, the ABS-CBN News Channel, DZMM/Teleradyo, and News.abs-cbn.com beginning 5pm that will provide in-depth analysis before and after the debate. Note: The full video replay courtesy of ABS-CBN will be available on this page later. ABS-CBN Integrated News and Current Affairs chief Regina Reyes has confirmed that all five presidential candidates will attend the debate. Vice President Jejomar Binay, Senator Miriam Defensor-Santiago, Davao City Mayor Rodrigo Duterte, Senator Grace Poe, and former Department of Interior and Local Government Secretary Mar Roxas have all agreed to the format and mechanics of the Luzon leg of the Pili Pinas 2016 Debate series. Miriam who skipped the Visayas leg due to health reason will show up this time. "Oh yeah I will be there!" she told reporters during the commencement exercise at Bulacan State University. Reyes said the Comelec debate will use townhall format as this would allow regular people to ask the candidates of some pressing issues of the society. The topics were carefully selected from entries submitted by the general public to ABS-CBN. Issues that will be tackled in the debate include metro traffic and public transport, job security, health, foreign policy, basic public education, OFW concerns, and peace for Mindanaoans in conflict areas. There will also be a “Face-Off,” where a candidate will pose questions to a fellow candidate. “We are dubbing it (the debate) as Harapan ng Taong Bayan, where real people with real issues will be able to participate,” ABS-CBN News department representative Francis Toral said. This final presidential debate will make use of an open-field venue and be aired abroad live for the first time via ABS-CBN’s The Filipino Channel (TFC). It will also be available via iWantTV. ABS-CBN's presidential debate which run from 6 p.m. to 9 p.m. It will also be shown online via live streaming services of Manila Bulletin and ABS-CBN’s online sites. Comelec Chairman Andres Bautista said he hoped the event will become a regular addition in future elections. “It will now become a tradition that will also be observed in succeeding elections,” Bautista said. “The Dagupan debate is the most proximate to the election day and I am sure whatever will transpire will have more influence in the minds of the voters,” KBP Board Chairman Herman Basbaño said. On February 21, the first run of the debate series held at Cagayan de Oro City was organized by GMA-7. On March 20, TV5 staged the debate at the University of the Philippines (UP)-Cebu. The latter became controversial due to misunderstanding of rules between a candidate and TV5. Who will dominate the third and final #PiliPinasDebates2016? Express your thoughts in the comment section below.